The glass-ceramic hob of the kitchen has come to revolutionize our lives. It is safe and energy-saving, two characteristics that make it a perfect appliance, an ally of all housewives. The only problem is that we don’t always know how to clean it in depth without scratching or damaging its surface. How to do it? Here are some tips to avoid mistakes and to proceed with the maximum care. 1) Once the kitchen is cold (it is never cleaned when it is hot), use a damp paper towel (remember: you don’t need sponges and you never use scrubbers) to remove food and dirt. 2) Next, we use a specific product that is specially developed to clean glass-ceramic hob (neither fat remover and nor dishwasher detergent), which of all the products on the market? One of good quality and maximum effectiveness. 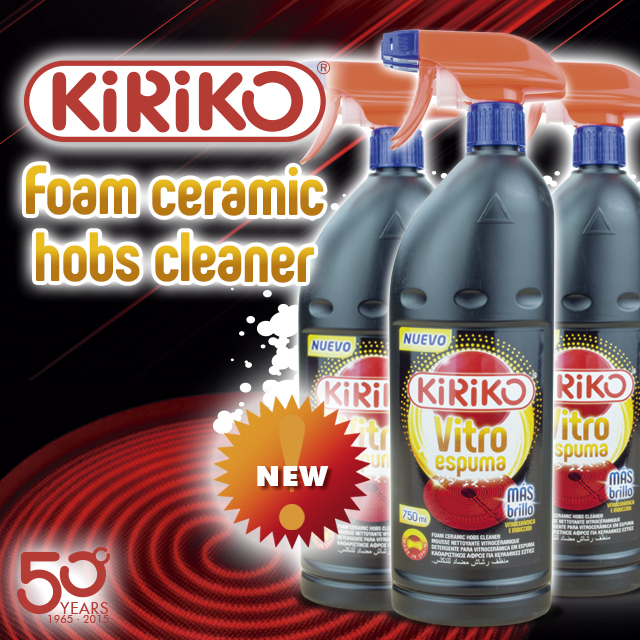 We therefore recommend KIRIKO VITRO ESPUMA, a new active foam cleaner that comes with a spray gun for quick and easy application. Spray and leave to act for three minutes, the time necessary for the foam to adhere to the dirt, facilitating the cleaning process and guaranteeing maximum shine. 3) Then, we proceed to pass a special scraper for glass-ceramic (yes, those that have handle and blade and are purchased in hardware stores and supermarkets) that will remove stains, as well as any other residue that has remained stuck. 4) Remove this new and effective product with a damp cloth and dry it with kitchen paper until the desired shine is obtained. Conclusion? The ceramic hob will be as good as new in a few minutes. Your care has never been easier, has it? So, try this new active foam now; delicate with the “vitro” and with our hands.